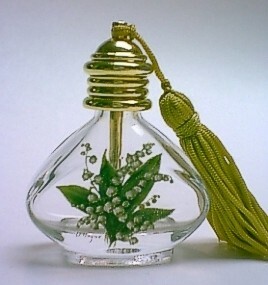 Finished: Crystal glass bottle with floral decor and fits with gold plated brass screw cap with stick inside and tassel decor. Europe style beautiful floral patterns with high temperature transferred. Perfumes and alcohol and scratches resistible. the brass cap and rod with genuine gold plated. Refillable and leakage proof.